What is a somatic cell count? 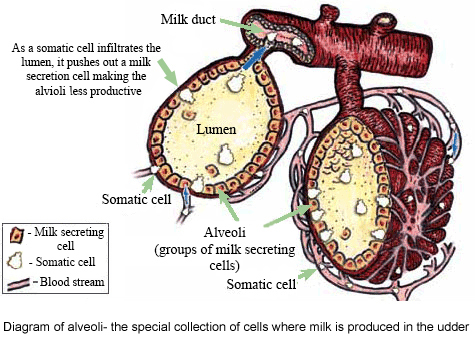 Somatic cell count (SCC) is the number of somatic cells found in a millilitre of milk. Somatic cells (or “body” cells) are a mixture of milk-producing cells shed from the udder tissue (about 2%) and cells from the immune system (the other 98%), known as leukocytes (also called white blood cells). Somatic cell counts are useful in identifying intra-mammary infection in an individual cow or herd. To understand a bit more about the cells and why they are found in milk we need to understand the function of leukocytes a bit better. What is a leukocyte (or white blood cell) and why are they important? Leukocytes are the cells responsible for identifying bacteria and killing them. Bacteria and other harmful pathogens enter the body in many different ways which is why these cells circulate through the body and make their way into different tissues. Just as nutrients are transported from the bloodstream into the udder to be converted into milk, leukocytes are also transported into the udder as a surveillance mechanism to look for bacteria which is why SCC levels are never zero. Think of these cells as a night watchman at a museum. Unless there is absolutely no chance for crime, you will always have 1 night watchman. If crime in the community increases, you may have to hire a few more guards. If one of the night watchmen sees someone is breaking in and sounds the alarm, you’ll have not only all of the night watchmen running in, but also a large number of Gardaí entering the museum to catch and get rid of the thieves. The same thing happens with leukocytes and infections. 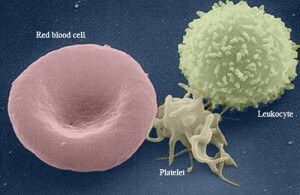 Leukocytes are always circulating because we are always under threat of infection. If one of the leukocytes on routine surveillance runs into some bad bacteria, they will signal to the rest of the leukocytes and other immune cells that there is a problem, so they rush to the area of infection-hence the SCC in the milk will increase. What happens when leukocytes infiltrate the udder during an infection? When lots of leukocytes move to the udder during infection, this results in an increase in SCC and a decrease in milk yield. The udder is made up of millions of groups of milk-producing cells, collectively called alveoli. Within the alveoli is the lumen where milk accumulates until it can be transported through the milk ducts and expressed through the teat. When an animal has an infection in the udder, leukocytes infiltrate the alveoli by breaking through the tight junctions between and knocking out milk-producing cells, to get to the area where the bacteria grow. This damage to the milk-producing cells, and to the junctions between them, means the cow will produce less milk. The determination of milk SCC is widely used to moni¬tor udder health and, thus, milk quality. When combined with bacteriological culture results, the factors of greatest importance can be determined. When SCC are elevated, they consist primarily of leukocytes or white blood cells which include macrophages, lym¬phocytes, and PMN. During inflammation, the major increase in SCC is because of the influx of PMN into milk. At this time, over 90% of the cells may be PMN. Milk from normal (i.e., uninfected) quarters generally contain below 200,000 somatic cells/ml. Many are less than 100,000. One study estimated that 50% of unin¬fected cows have SCC under 100,000/ml, and 80% have under 200,000. An elevation of SCC (above 300,000 ) is abnormal and an indication of inflammation in the udder.